As I prepared to embark on my first solo island adventure, I knew that the perpetual photographer in me would want something more versatile than the waterproof point-and-shoot camera I had been taking on my aquatic endeavors. While I still adore my Lumix (and always keep it close at hand on the water), that camera was, and is, better for short-range selfies, quick snorkeling snaps or for passing off to another person. Planning a solo trip meant that I wouldn’t necessarily have another person as my photographer-in-tow, so I coughed up the dough and bought myself a GoPro Hero4 Silver. GoPro is nearly synonymous with extreme adventuring, and after purchasing one, I can see why. It takes great photos and has enough available mounts to make it fit any adventure you can imagine. GoPro 3-Way Mount – (approx. $55.99) – When you roll solo but want to take lots of pictures, a selfie stick is a must (as long as you don’t mind the stares, which I don’t). Boatloads of research led me to this beauty, which is a bendable, reposition able 3-in-1 grip, selfie stick and monopod (it happens to have a tripod foot tucked secretly inside). Selfie stick + tripod = no brainer to me. It’s a bit of a doozy on cost, but well worth the money if you ask me. The Strap – (approx. $59.99) – Mounting the camera to your body somehow, somewhere is one of the defining abilities of the GoPro. You get crazy-cool angles and immersive photographs that can only come from strapping the camera to yourself. What I LOVE about this particular mount is the flexibility to strap it to any place on your extremities (upper arm, forearm, leg, hand, etc.). For bonus points, it has a swivel that enables you to change the direction of the camera without reattaching it. Score. Jaws Mount – (approx. $39.99) – This is the mount that I was most on the fence about, but man am I glad I got it. While it’s a bit bulky, it enabled me to attach my camera to any number of surfaces/objects and get those full-body, in-context shots that I new I would want. Bodhi Floaty Case – (approx. $24.99) – Let’s face it, the greatest fear of taking a several-hundred-dollar piece of equipment into a large body of water is inadvertently donating it to the depths. Yes, GoPro makes a floaty that you secure to the backdoor, but it covers the entire screen on the back of the camera—and that screen is half the reason to buy the Hero4 Silver. After much research, I landed on the Bodie Floaty, which worked like a charm. It kept my GoPro afloat, even with a relatively heavy selfie stick attached, and I could still see the screen with it attached. Anti-Fog Inserts – (approx. $14.99) – The only time I remember being dry in the 4.5 days that I spent on the island was when I was sleeping, which meant that my gear pretty much stayed wet as well. Thank GOD for the GoPro fog strips, which go inside the waterproof housing to keep the dreaded lens fog at bay. My sunglasses may have fogged up every time I left the hotel room, but with three of these strips tucked securely in my GoPro housing, my sunglasses were the ONLY things that flogged up. 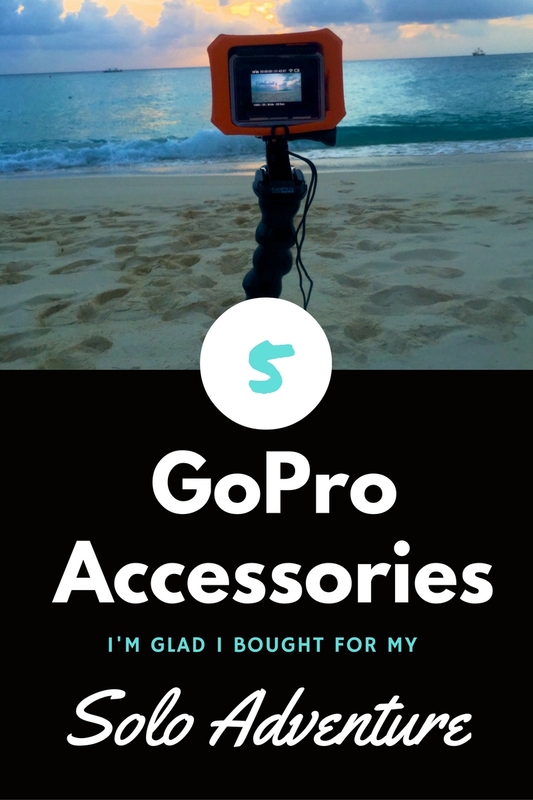 I’ll admit that solid GoPro accessories don’t come cheap. Most cost more than I wanted to pay, but I wasn’t about to buy a $300 camera and loose it in the water because I was too cheap to buy good mounts and accessories. With that, though, I do bring you this pro tip: Best Buy will price match items (even to Amazon), so do your research before you buy.